It seems that the time is ripe to analyze the definition of "rollers", "gentle rollers" and the "social ride". I believe the Cappuccino Ride can now only be used for the Onekan-route 20 loop which involves a stop at Starbucks. This ride has now been truly demoted to a recovery ride and is reserved for Sundays. Firstly, quite out of character, we stuck to the original plan - James K's plan that is. The ride took us from Ebisu (James K, Michael H, David C, Tyler, Graham, Fixie James, Fixie Tim, Eileen, Pete (newbie & thus lamb to the slaughter) and me. Along the river we picked up James M and at Fussa, Fumiki. All Daves and one Davina, but Davina had turned back already as she was just out to try out her new Laskey which James M had built up for her the previous day. That was the first sensible decision of the day. Having not ridden for 2 months and with family commitments, David C, the only real Dave in the group, turned around close to Itsukaichi. It was here that I bumped into my old colleague and now one of Tom's riding partners, Matsuzawa-san. 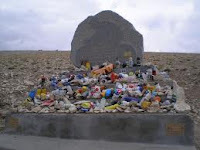 He too was on his way home after an quick assault to Kobu Tunnel, a place I did not know but, unbeknownst to me, was soon going to. to give his life to cycling. We would have been shocked and saddened had he expired but we would have saluted his sacrifice. Perhaps the good folk of Honjuku would erect a shrine to him similar to the Tom Simpson memorial on Mont Ventoux. Michael H turned back as well to carry out his duties as a board member of the prestigious tennis club which counts Their Imperial Royal Highnesses as members. All credit to Pete who had not ridden in a long time who made it up on his new bike - but he was toast at the top. As for the fixie boys, well..... chapeau I thought, but triple chapeau when I saw these guys descending - and they seem to love it. While taking a break at Tomin no Mori it struck me that Fixie James, clad in all black with a bright orange helmet looked like something out of the 70s/80s punk/new wave/ synth band, Devo. See what you think. 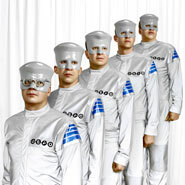 Like Positivo Espresso, membership of Devo has been described as "fluid". Another tenuous link is the song "Mechanical Man", reminding us of Mssrs Tom Boonen & Spillaert. Down the other side and a stop for fluids at Watanabe & Watanabe. It was here that there was some debate about routes and until this point one could have called it a social ride. 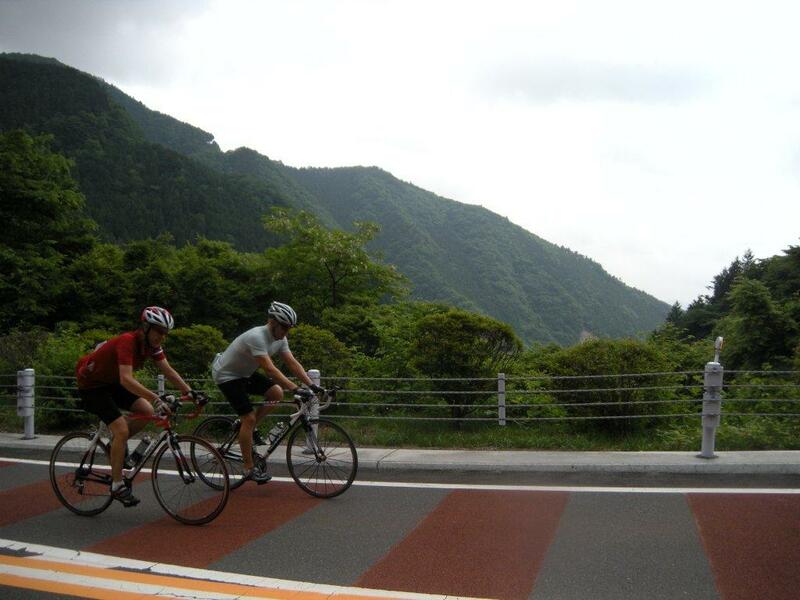 James M had assumed we would return along Okutama and down through Ome but James K had planned turning other way and taking in a few "rollers" which would lead us back round to near the bottom of the Tomin climb. Pete was shot and said he couldn't face another hill to which come of us urged him to stick with us because there were just a few "rollers" ahead. Very sensibly, he listened to his legs and headed back towards Ome with Fixie Tim. So what is a "roller"? Our first roller turned out to be a shortish climb of 11%+. At the top of the next roller, which by the way folks turned out to be Tsuru Toge. I questioned James' use of the term roller. His reply: "I never said they were gentle rollers". Thus I deduce that a "gentle roller" is up to 9% while a "roller" is 9-13%. Of course, the next "roller" was the climb up to the Kobu Tunnel. Be warned, now you know the difference. Always be on the look out for the word gentle. Also beware when you are invited on a social ride. It could turn out to mean a 200km+ ride with 2000m+ of climbing and a stiff headwind back along the river with a rider who likes to attack his friends. The lungs-on-sticks, James M and Fumiki, went tearing up these rollers like cats who have just had their man-bits dipped in hot water. While he has always been fast up hills James reports that Fumiki has got even faster, no doubt spurred on by James' attacks. Worth noting that Fumiki went up Fuji in 1:11 last weekend. While my cadence at one point dropped to 52 I could see Fixie James ahead grinding it out at about 30. I don't really understand why these guys want to put themselves through so much pain. Watching him descend on 13% slopes with no brakes not only left me in awe but terrified me as well. I knew Fixie James had a bulging rear tire that could have blown at any time. He said he had fun, but was cooked when we returned to the 7-11 and took the train home from Itsukaichi after trying to patch up the tire. Smart decision as the headwind we faced from there back home was very stiff. James K must have arranged to meet his medicine man at the 7-11 or applied a testosterone patch as he took over along the river. The wind drained me and I was lucky that James M dropped back to pull me back to the group. Fumiki got cramp in his right calf muscle. As the ride went on Tyler's attendance of the volley-ball game started to come into question. First he was moving from playing an active role to perhaps being a setter, then it moved to him coaching & encouraging from the sidelines to perhaps never actually making it. A good day out, tough ride, great company. 205km, 2100m of climbing and 8:30 in the saddle. Back home for dinner with the parents-in-law. No beer as I gave my father-in-law the last one. Thanks for all the fun reading Dominic! Thanks also for the invite - couldn't ride though yesterday. Next time I'll make it a point to join this bunch! 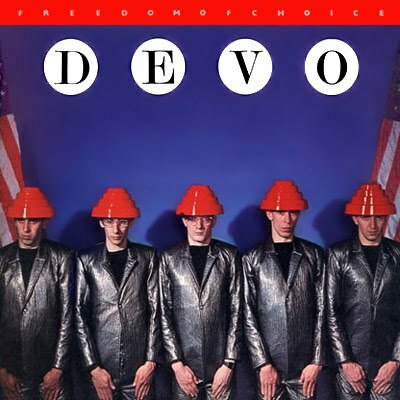 I (used to) have this DEVO album..."Whip it!" of course being my favorite followed by "Gates of Steel". Sounds surprisingly contemporary today. A bit sad to see another togebaka record of mine (my last?) going up in smoke...but life goes on. Good job James M.!! The rollers were "Vatooome!" All in all "Fackin Brrilliant" day. The time would have been different but Fumiki's chain slipped.The end was very dramatic with a sprint finish 500m from the line. Vatoooome certainly, but there was some ai-ya-ya-ya-yai when we saw the "rollers" ahead. Thank you for the mention! Actually it wasn't that I hadn't ridden in a while, this was my first real ride on my first road bike which I've had for less than 2 weeks. Thanks for the ride gents. That was, well, exhilarating. I remember being overcome by this intense need to sleep on the way down from Tsuru pass, but that dissipated when we fueled up at the next market. The last roller on the way up to the Kobu Tunnel was almost pleasant, but I nevertheless stuck with my grinding approach, there being no other tools in my bag. Wow, seems like you had a lot of fun and some pain along the way. A damn shame I missed it, but hopefully I can do at least one more big ride before France. Rule 5: This man clearly understands it! Good news for "the older crew"
Tom Boonen - a cyborg?